While there is much talk of a possible slowdown once interest rates rise further, the Paris property market continues its impressive price growth. Prices rose 4.4% in 2016, and it looks like 2017’s first quarter has started even stronger. For December’s end, the notaires figures show an average price per square meter of €8,340, representing growth of 4.4% over the year. The map below shows price/m2 in each of Paris’ 81 neighborhoods (Quartier Administratif) recorded by the Notaires. It is important to note that these are average net seller prices with no real estate agency fees or closing costs added. To equate these figures to likely listing prices approximately 5% agency fees and 7.5% closing costs, plus some margin of negotiation need to be figured in. The figures in this map come at the end of 12 months of astonishingly high growth in some parts. 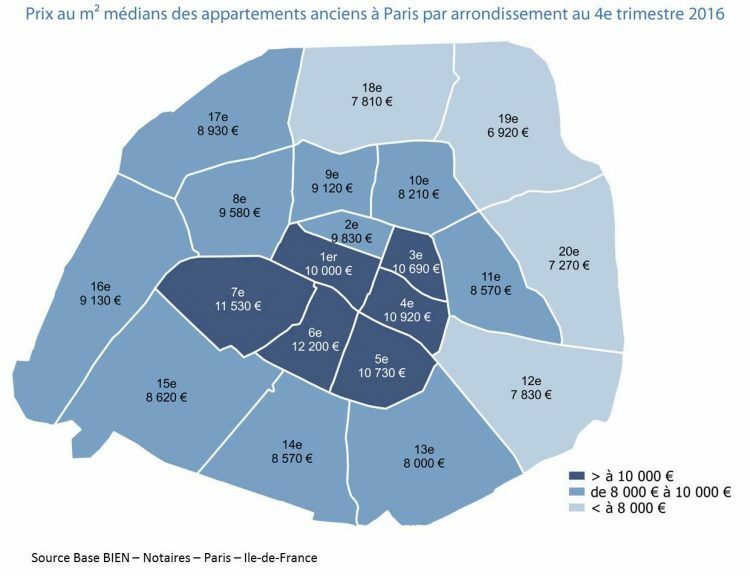 For example, prices in the 3rd arrondissement grew 8.8% during the year, its four Quartiers finishing with an average of €10,690/m2 (€7,600 at the low end, to €15,300 at the top end). The Notaires’ figures for the end of January show a price/m2 for Paris of €8,360, and they are predicting a new record of €8,570 by May. This would eclipse the record of €8,460 set in 2011. This estimate seems conservative in the face of recent findings, however. More up-to-date figures from French property sites indicate the record has already been broken, and by some margin. Seloger has recorded a price/m2 in Paris of €8,808 at the end of March, a 4.5% year growth already for the first quarter of 2017. The price growth for some arrondissements, like the 14th (7.5%), 9th (6.9%) and 4th (6.8%) almost beggar belief. Meilleursagents has recorded a yearly growth in the capital of 6.6% as of the end of March. Expect figures for the first quarter of the year from the Notaires in the coming months. Will they confirm the findings by Meilleursagents and Seloger? These sites have a margin of error because the sales are in process and not closed yet, but it’s clear that the market is surprising all onlookers with its explosive growth as buyers fight over a limited housing stock before mortgage rates rise further. Source: Paris Property Group (link), Notaires de Paris, Seloger, and Meilleursagents. Galleon – France Property Search.